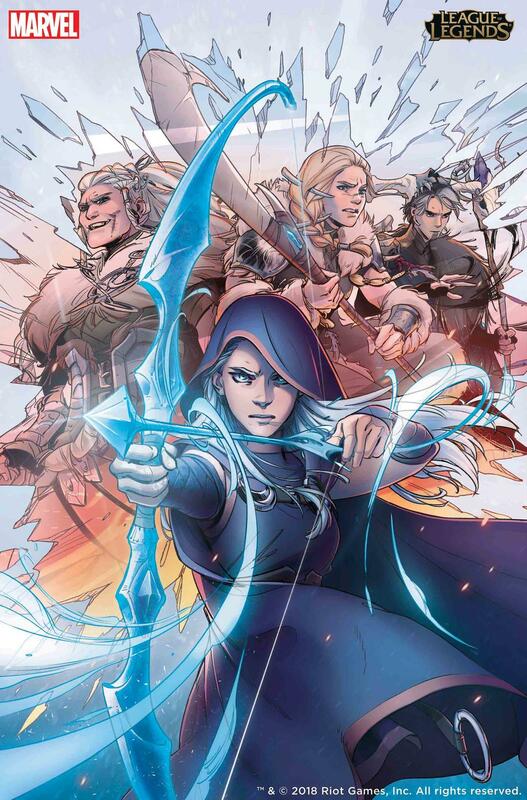 The LEAGUE OF LEGENDS: ASHE: WARMOTHER graphic novel will be released in May 2019! Marvel and Riot Games are teaming up for an epic collaboration to bring the world of "League of Legends" to comics! A graphic novel published by Marvel and Riot Games will be released in May 2019, making this the first full-length comic based on "League of Legends" games. This complete collection will be the culmination of a series of monthly graphic novels based on the hit game that will be available on digital platforms beginning Wednesday, December 19! The series will kick off with an origin story -- LEAGUE OF LEGENDS: ASHE: WARMOTHER will follow the journey of one of the original League of Legends champions, the Iceborn warrior Ashe, who struggles with her role as a leader for her people in the world of Runeterra and her mother's fanatical expectations. Riot Games writer Odin Austin Shafer will make his comics debut alongside artist Nina Vakueva (HEAVY VINYL), a nominee for The Russ Manning Most Promising Newcomer Award. Cardinal Rae will provide lettering. “We love comics as a way to tell stories because it gives 'League of Legends' fans an opportunity to see the world of Runeterra and not just read about it,” said Greg Street, Head of Creative Development at Riot Games. “We see similarities between the League of Legends Universe and the Marvel Universe, as both of them feature an array of characters with compelling and diverse backgrounds. Marvel's success at developing a world through comics and creating great stories is industry-defining, and we're thrilled to be working with them to bring our own stories to life." LEAGUE OF LEGENDS: ASHE: WARMOTHER will be available in May 2019! The first part of the series hits digital platforms Wednesday, December 19!